Not all hikes offer spectacular views of the ocean and lakes, but what good are those hikes on foggy days? There are plenty of hikes that weave in and around the mountains and lakes that offer tranquility and peace. 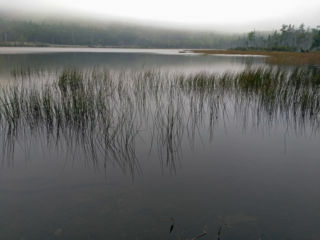 The Hadlock Ponds area is one of those worth taking in on foggy days. One good thing about these hikes is that there are plenty of different loops that one can do. I prefer the hike that starts out near Lower Hadlock Pond and comes back around by Upper Hadlock Pond. It takes about an hour-and-a-half and can be done in multiple different ways. We recommend having a trail map with you because there are also plenty of non-Acadia hiking trails (read: private property) that are definitely OK to hike on but aren’t as well signed as those in the actual park. This is especially true on the southern end of Lower Hadlock Pond (Schoolhouse Ledge in particular). I start out at the Brown Mtn. Gate parking lot and cross Rt. 198 to find the trail that will take you to Lower Hadlock Pond. Go right at the pond and follow that to the end until you get to the wooden bridge. To stay on Lower Hadlock, and to do the easier hike up Norumbega Mtn, go left. To head north, as I do, stay right until the next trailhead. At that next trailhead, go left toward the Goat Trail parking lot. Take this until you get to one of the parking areas off Rt. 198 an the start of the Goat Trail hike, which is the harder trail going up Norumbega Mtn..
From there, cross the street to the north side of Upper Hadlock Pond. At the carriage trail, you can go right on the carriage trail, which will bring you back to the Brown Mtn. Gate parking area, or you can head straight up to continue on the Hadlock Brook Trail. Going straight probably adds about 30min to the hike or so. I like to stay on the carriage trail because I like the walk along there, especially with my dog in tow (or in the lead, depending on how many chipmunks are about). The carriage trail is the Around Mountain trail. Along the carriage trail you’ll eventually find the Hadlock Ponds Trail on the right. If you take that, it’ll cross back over Rt. 198 and bring you back to Lower Hadlock Pond and eventually the wooden bridge. I stay on the carriage trail still. When on the carriage trail, you’ll come to a couple of sign posts. Just follow the road back to the Brown Mtn. Gatehouse and all will be well. The entire hike the way I described it is about 1.5 hours. Staying on the Hadlock Brook Trail makes it about 2 – 2.5 hours, and cutting over to the Hadlock Ponds Trail is about 2 hours flat. For info on what these hikes are like, come stay with us and we’ll gladly point you in the right direction: www.miramonte.com. My favorite hike on the island is the Parkman Mountain to Bald Peak loop. I don’t know why it’s my favorite. I guess it has the moderate level of difficulty that I enjoy, and I definitely prefer natural loops, which bring you back to where you started without going over the same terrain. This loop is like that, and even better, one can decide to add on or take off loops, thus making it either shorter or longer depending on one’s needs. I always park at the Parkman Mountain lot (or across the street), which is on the road into Northeast Harbor (Rt. 198). The lot is at the crest of a hill if going toward Northeast Harbor, but if that’s full then there are lots farther down the road on the other side of the hill. These other lots are just a bit farther away from the trailheads, so just be aware of your whereabouts. Now, it is much easier to do this loop with a good trail map. This is because the Around Mountain carriage trail winds across the trails of both peaks, and it’s easy to get a bit disoriented. One common theme I hear from guests who didn’t have a trail map is that they ended up at a different parking lot from whence they came. This really isn’t a problem except that walking back up to your car on Rt. 198 is not as nice as walking the same direction on the carriage trails. From the Parkman Mtn. parking lot, take a right at the first sign post on the carriage trail. This will bring you to sign post #13. Take a left here and walk up the carriage trail a few minutes until you come to the Parkman Mtn. Trailhead. Head up Parkman Mtn, taking a left near the top to the summit at the trail marker that splits Parkman from Bald Peak. Remember this trail marker for the way down. 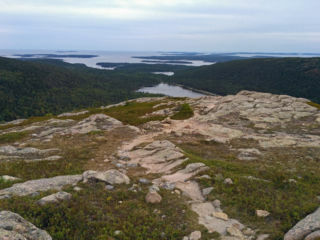 Enjoy the views of Somes Sound from the summit. Head back down to the trail marker where you turned left and go left again toward Bald Peak. Follow that path no more than 10-20 minutes to the top of Bald Peak. Now enjoy views of the Hadlock Ponds and the bay beyond Northeast Harbor. Head down the other side of Bald Peak until you get to the carriage trail. Continue across the carriage trail on the hiking trail. If you do this, you’ll hit another carriage trail down further. This is where folks most often end up at the wrong parking lot. At this carriage trail, head right back up to sign post #13, and then turn left to get back to the parking lot. Instead of going straight across, turn right on the carriage trail and walk until you get to sign post #12. At that intersection, go left and – surprise! – in a minute or so you’ll walk right past the Parkman Mtn. trailhead that you went up to start your hike. Follow the carriage trail down to sign post #13 and take a right to get back to the lot. All told, this is a 2-4 hour hike round trip. Don’t be afraid if there are a lot of cars parked at Parkman Mtn. Not everyone is doing this loop or even these mountains. It’s a great place for cyclists to get on the carriage trails and do some more difficult riding. And as always, if you’d like to hear this person, check out our availability calendar and book today at: www.miramonte.com.